Egg Dying- Chemicals Not Included! Easy-to-use directions to make multiple colors. Its that time of year! Easter is soon approaching, and many of us, including myself are going to dye eggs with our children. Traditional egg dye kits are loaded with a plethora of nasty chemicals and artificial dyes, many of which can be harmful to consume. However, nature-friendly company eco-kids’ eco-eggs are all natural, with dyes made only of plant-based ingredients. (Gardenia flower, curcumin, annatto seeds, red radish, red cabbage, and purple sweet potato.) While it isn’t quite Easter, I broke out the white eggs and boiling water to try the kit myself! My two sons, Hanz (17) and Riley (8) helped me dye the eggs. The kit included three dye packets: purple, orange, and blue. We mixed the dyes into warm water and got started. Right off the bat we noticed the time that was required to submerge each egg, an average of 5-8 minutes. This could pose an issue with impatient young children, so it might be beneficial to let the eggs sit while they are preoccupied with another activity. The kit also included a piece of white crayon wax, to allow kids to design any kind of egg they want. 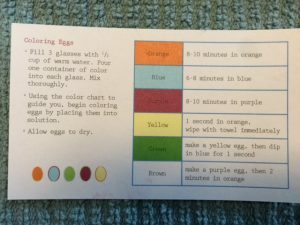 Don’t let the amount of dyes fool you, the color chart included in the kit helped us make yellow, green, and even brown eggs! After submerging the eggs the colors came out surprisingly well-purple was the most strong, followed by orange, and then blue. However, the process to get a green egg took a few tries, and resulted in a lighter, pastel green. It was challenging to get a solid green egg, as it required a dip in both orange and blue dyes. Another color added to the mix would be helpful, perhaps a red or green, to create a greater option of colors without having to go through the complex process. We dyed nine eggs total, each having their own unique patterns. Spotted, striped, zig-zag, and classic solid eggs were all included in the mix. We can’t wait to eat them even though we have to un-peal these beautiful creations! The kit also included a wheatgrass growing kit with the intent to display the eggs atop of it. The compressed soil and seeds were included in the main container; a cute, creative, and natural way to display your dyed eggs! Overall, I found this kit to be very simple and easy to use, yet still offered the quality of a traditional, store-bought kit. Would definitely recommend to all of the natural Moms and Dads out there! 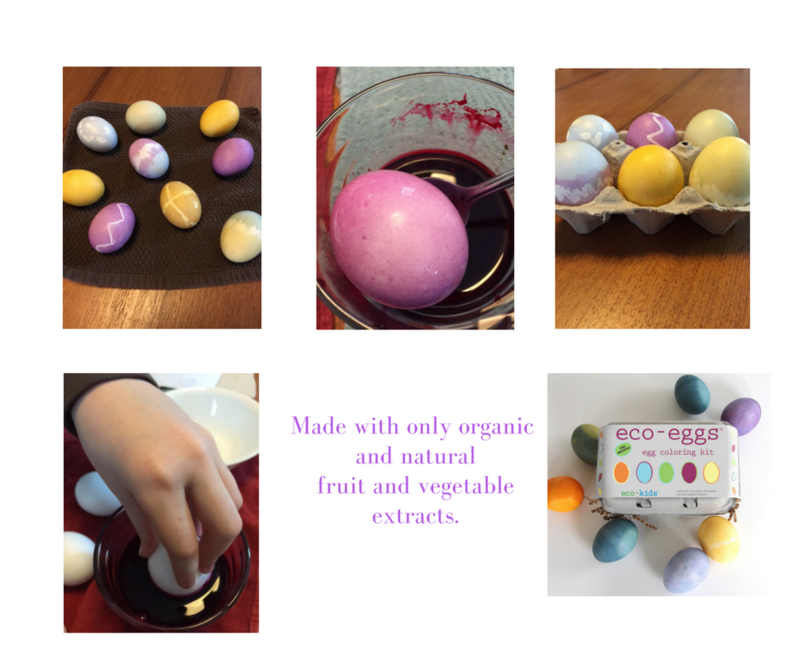 This entry was posted in Blog and tagged eco-kids eco-eggs, egg dying kit, green team product reviews. Bookmark the permalink.